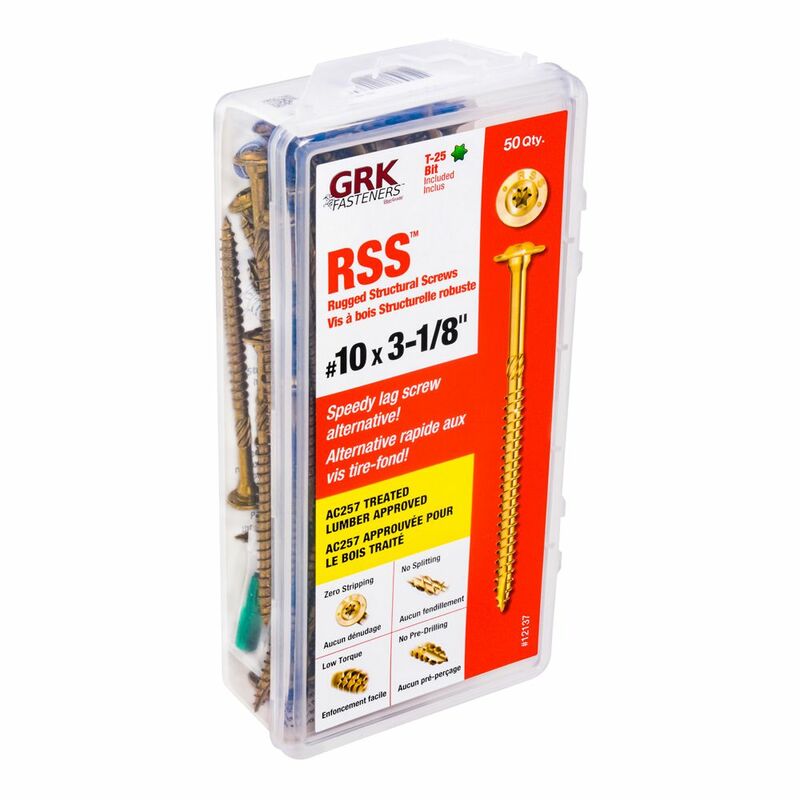 #10 x 3-1/8-inch Star Drive Round Washer Head GRK RSS(TM) Rugged Structural Screws Handy-Pak - 50pcs is rated 4.9 out of 5 by 9. Rated 4 out of 5 by JimG from These screws don't cam-out (strip) like Phillips or others, and are easier than square heads. Th... These screws don't cam-out (strip) like Phillips or others, and are easier than square heads. The reverse thread shank helps pull boards together but there is room for improvement there. Also the self starting point is good but doesn't always work in hard grain or knots. Maybe a little deeper groove would be better? Anyway, still the strongest screw out there, pricey tho, and a bigger box would be better for those of us who use them a lot. Rated 5 out of 5 by Dezz from BEST SCREWS ON THE MARKET TODAY!! Ive been using GRK fasteners for two years now. By far the best screws you can buy! The ease of driving them is phemomenal. The threads cut right through wood and grab with awesome power! I will never buy anything but GRK. Bye bye basic phillips screws!! Rated 5 out of 5 by DoggieDaddy from Excellent screws, I won't buy any other brand. No failures,... Excellent screws, I won't buy any other brand. No failures, they don't strip out when driving them, and the number of bad screw out of the box is very limited (maybe one out of ten boxes). You will be disappointed when using these; they drive easy and hold. GRK makes the most reliable fasteners period. Rated 5 out of 5 by DoggieDaddy from Best screw on the market for construction. I started using... Best screw on the market for construction. I started using the GRK line about five years ago and have not regretted it once. Never had a failure; maybe one bad screw out of ten boxes or so. Easy to drive into most construction materials without striping. Wont use anything else. Rated 5 out of 5 by Utbartow from This big box of screw was a great value. These... This big box of screw was a great value. These screws with a torx head bit are by far superior to Phillip's head screws. They surprised me with how easy they were to install and how well they hold. Rated 5 out of 5 by Demetri from Worked well.... Worked well. Rated 5 out of 5 by Hammer from These fasteners drive themselves with little effort. You don't have to put your shoulder into it ... These fasteners drive themselves with little effort. You don't have to put your shoulder into it to start it and therefore no false starts and landing the chuck into your material when it kicks over on you. Be careful when you drive em cause if you need a minimum penetration of the head they tend to want to keep going through the wood with no problems at all.... Also with the advent of the torques type driver, there is very little stripping and chowdering of the screw.